Well, the inevitable has finally happened. After a few years of speculation about the future of Indiana Jones in the fallout of Disney’s acquisition of LucasFilm, news broke yesterday that Disney now holds the rights to all future Indiana Jones properties, from movies to cartoons to toys to video games to theme park rides. There are a few ways to take this news as a fan of the kind of cinema that spawned RAIDERS OF THE LOST ARK. The first, most obvious (at least to me) reaction is a negative one. A massive, faceless corporation continues to gobble up once-original and fresh franchises with the intent to manufacture more money. Disney owns Marvel, Pixar, Star Wars, the Muppets, and Mickey Mouse, all of which were at different times symbols of individual expression, vivid imagination, and counterintuitive cinematic storytelling. Certainly, movies have changed. The trend of conglomerate-owned studios – an environment in which Indiana Jones was born, after Gulf & Western purchase of Paramount – has been extrapolated into a bizarre status quo in which, essentially, two global behemoths (Disney and Warner Brothers) seemingly own 98% of the world’s popular entertainment. Like I said, that’s a whole separate conversation, but it leads us to a healthy assumption to make – and say – out loud: INDIANA JONES AS WE KNOW HIM IS DEAD. The thing with that is that he’s been dead since 1989, when Lucas, Ford, and Spielberg rode him into the sunset before Best Director Oscars, visual effects revolutions, career slumps, CEO responsibilities and grandchildren changed each man, respectively. It seems that INDIANA JONES & THE KINGDOM OF THE CRYSTAL SKULL – a movie which I still think is a good movie, despite being an inorganic fit into the previous three films’ saga – is going to function as an odd, ill-fitting bridge between the two phases of the character’s history. 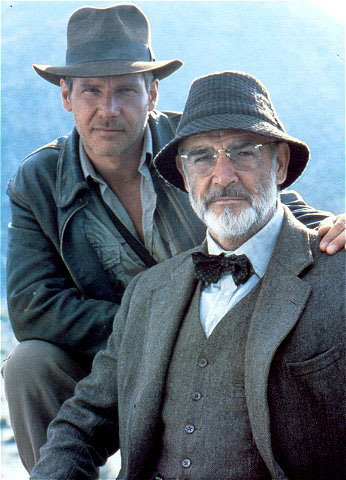 Let’s make it clear: To the people that control his destiny, the words “Indiana Jones” no longer name a character. They name a brand. “Indiana Jones” is no longer Harrison Ford in the fedora and leather jacket. I’d wager to say that absolutely none of us – including myself – are happy about that, but it’s a fact that we have to live with, and once I get over my righteous indignation, I can begrudgingly admit that I’ll show up to the movie theater to see any movie with that logo on the poster. With all that ugliness and sadness on the table, let’s quit dragging our feet and get into it. Aside from all the toys and video games and soft drinks and fruit snacks and theme park rides and sippy cups… Where do the Indiana Jones films go from here? It’s been rumored for years that enough of the key players are passively interested in a fifth – and presumably final – outing for Harrison Ford’s Indiana Jones. There are a lot of variables in this formula, however. These “key players” are all in their sixties or seventies, and while there are lots of things that make RAIDERS films special, one of the most obvious things is physicality. Cinema is movement, clearly, and one of my favorite quotes about RAIDERS OF THE LOST ARK is that it is “the reason God created cinema”. We need a hero that can run, jump, and fall, and we need a group of people behind the camera that can run, jump, and fall with him. The one thing that makes me optimistic about this scenario is the idea of the “Spielberg Apology”. When Steven Spielberg makes a film that is critically reviled, he follows it up with a film that is critically praised. CRYSTAL SKULL led to TINTIN, WAR HORSE, and LINCOLN. A.I. led to MINORITY REPORT. THE LOST WORLD led to SAVING PRIVATE RYAN. HOOK led to JURASSIC PARK. And, of course, the one that started it all… 1941 led to RAIDERS OF THE LOST ARK. I think that if this movie gets made, it will get made with the knowledge that CRYSTAL SKULL disappointed the majority of the fanbase, and hasn’t aged well. So, that’s the positive; the negative is that for Disney, this is not a very good long-term plan. There are no franchise possibilities for a star in his 70’s, and I think even the densest executive would deny any franchise potential in Mutt Williams, considering that character’s emasculation and Shia LeBeouf’s generally falling star image and refusal to be a Hollywood darling. So, while this film might happen if all the pieces fall into place relatively quickly, I think to Disney execs it looks like a necessary trifle to get to a larger goal. This might be our worst case scenario. It’s also the most likely. After all, why would Disney tie to a series of films that they can’t make money off of by? Remember, Paramount retains distribution rights for the first four films. However, once we accept that this corporately owned intellectual asset – not character, remember – is going to exist beyond that glorious shot at the end of INDIANA JONES & THE LAST CRUSADE, it’s a very clear reality. I will add that it also makes sense in character terms. Since the character’s inception, Indy has been inspired by James Bond, and one of the 007 series’ greatest assets is its malleability. This isn’t STAR WARS or LORD OF THE RINGS, where timelines and strict continuity are essential. The problem arises, however, when you note the fact that the character is a metaphor for 20th Century America. I’d argue that a “modern day” Indiana Jones makes very little sense, although Bond is always updated to be contemporary. 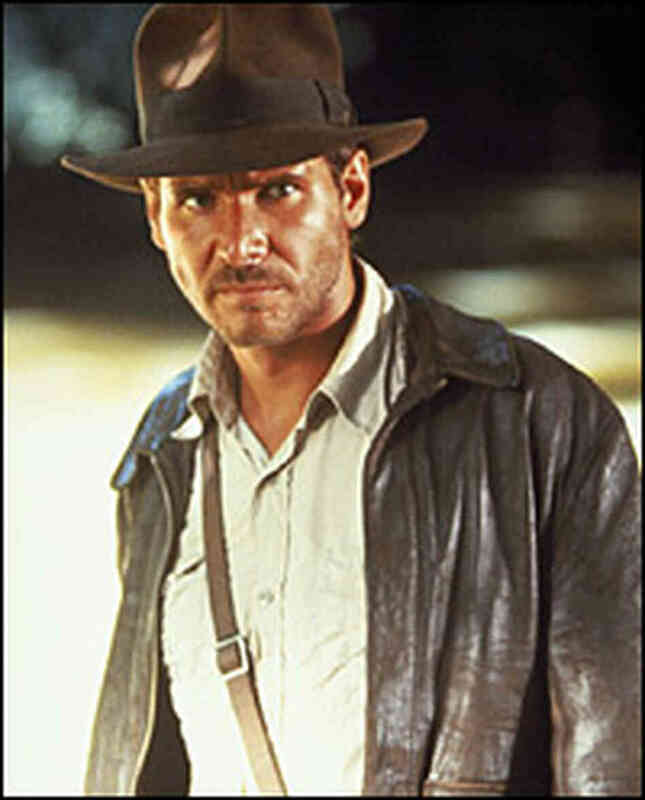 There might be an acceptable way to reboot Indy; cast a charming actor as the pre-RAIDERS adventurer working as a grad student. Show him meeting a young Marion Ravenwood. Show his relationship with Brody and Abner Ravenwood. If you hire great technicians and a promising young actor like Joseph Gordon-Levitt or Jake Johnson, this could be a promising start. Clean reboots have worked for Batman, PLANET OF THE APES and 007 in both critical and financial terms. But again, there are so many specific things that make those first three RAIDERS films soar that this is much thinner ice. To me, this is the best case scenario. There are a number of ways to creatively extend the *shudder* franchise potential of the corporately owned intellectual asset labeled as “Indiana Jones” that might be new and different enough to mimic the blast of imagination and wonder that was RAIDERS OF THE LOST ARK. Imagine a more globalized Indiana Jones where the franchise is handed off to a grown-up Short Round, who adopts the mantle of Indiana Jones into the 1960s, 1970s, and even 1980s. This keeps the America metaphor going and also opens the door to appeal to some of the great modern Chinese filmmakers like Yimou Zhang or the Korean filmmaker Kim Jee-Woon. If you’ve seen his epic THE GOOD, THE BAD, THE WEIRD, you’ve essentially seen an update of the Indiana Jones formula, and it works marvelously. GIVE INDIANA JONES TO PIXAR. Obviously, both are owned by Disney. Obviously, this would take Indy into the realm of animation, where age can be worked with. It unfortunately loses the series’ tradition of real stunts and practical effects, but THE ADVENTURES OF TINTIN and THE INCREDIBLES have taught us that if you build a real enough world, and your action sequences are well-choreographed, the action can feel plenty real. This would help both the Indy franchise and Pixar as a company, in my opinion. It would give Pixar a slightly more “grown-up” secondary direction to supplement its primarily G or PG-rated animated features. It would give Indiana Jones access to some of the best creative minds in the industry, and allow those minds to play in a playground that surely influenced them all. It would make money for Disney by combining two properties that have both been criticized for stagnation and repetition. All of the technicians from the original films can be brought in to consult. With his TINTIN experience, Spielberg could even come in and direct – although I don’t think anyone would be offended by a Brad Bird or a Pete Doctor taking the reins – and, best of all, Harrison Ford can come in and comfortably perform his part for as long as he’d like. The same goes for all those great supporting characters played by Karen Allen, John Rhys-Davies, and yes – even Sean Connery. So with all that said, let’s just remember that even if Disney announces an ADVENTURES OF MUTT WILLIAMS teen soap opera to be aired on the Hallmark channel next Monday, or if they recast Indiana Jones as a skinny jeans-wearing Zac Efron hunting for Kim Jong Un’s hair product, none of these take away those amazing films from 1981 to 1989. The Indiana Jones of RAIDERS OF THE LOST ARK might never be coming back, but that only makes his adventures all the more special. Thanks for reading! Be sure to check in on Cinematrimony and Aspect Radio for some great film-related podcasts, and if you’d like to keep up with my moviemaking, check out my shorts at benstarkfilm.com. We’ll be premiering a new music video this week, so keep your eyes peeled for that!